Milltown Memories 7: Just the Ticket! 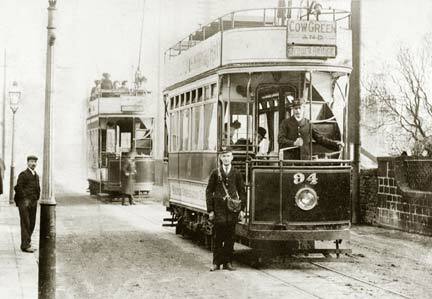 Trams had reached Mytholmroyd by 1901 but disputes over the siting of electric standards prevented the line from extending to Hebden Bridge until the following year. There were plans to run trams to Todmorden but these were shelved and Hebden Bridge remained the terminus seen here in 1905. The streets of Todmorden never saw trams but the town had the distinction, in 1907, of being only the second in the country to have buses run by the local authority. They were so unreliable in the early days, however, that a comic postcard appeared. Disgruntled passengers appeared to prefer anything but buses! Click photo to enlarge Code Nos BT 995CC and BT 990CC. 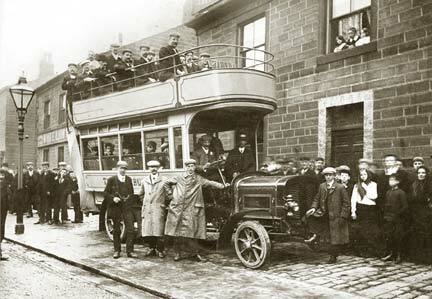 The comic postcard and bus photo are reproduced by kind permission of Mrs Carolyn Clayton. Pre-dating the town-run service by two years patrons of the White Lion and Greyhound, Shade, about to set out on a day trip to Blackpool. The Haberghan - a very early double-decker bus - ran from Burnley and the journey took over four hours! The two pubs enjoyed an amicable relationship until 1939 when the Greyhound closed. The White Lion shut in 1961.